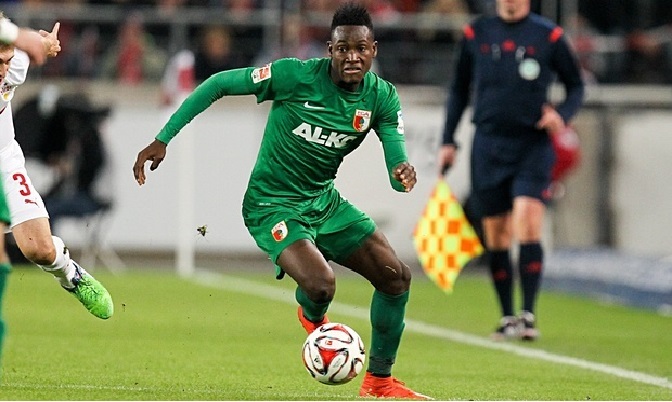 Baba Rahman is expected to complete his move to Chelsea later this week. Chelsea’s pursuit of defensive reinforcements looks like finally making some progress after they agreed a deal with Augsburg for Baba Rahman. The Ghana left-back, 21, has been earmarked as a long-term replacement for Filipe Luís, who was sold back to Atlético Madrid after only a season at Stamford Bridge. Negotiations have been continuing for weeks, with the Premier League champions having a bid of £17.2m (€25m) rejected over the weekend. Augsburg had been holding out for a fee closer to €30m but with Rahman having already agreed personal terms for his move to Stamford Bridge, the Bundesliga side have now reached a settlement over the structure of payments. Chelsea are expected to pay around £14m up front, with several significant bonus payments up to £6m due should he play more than 100 matches. The player and his agent have already travelled to London and a medical is planned for this week. Augsburg, who recorded their highest finish of fifth in the Bundesliga last season, completed the purchase of a replacement for Rahman last week in the form of Philipp Max from Karlsruhe. Rahman, who only signed from Greuther Fürth last summer, made what appears to be his last appearance for Augsburg on Friday in the cup victory over fourth-division Elversberg. He performed a lap of honour afterwards to say goodbye to supporters. “I would like to continue working with all players, but when you sign someone like Baba from the second division and he’s on Chelsea’s radar 12 months later, it does make the coaching staff proud,” said the Augsburg coach, Markus Weinzierl. Chelsea were alerted to Rahman’s promise by their former manager Avram Grant, who coaches Ghana. Rahman was a member of the squad who reached the final of the Africa Cup of Nations in February.